"The beauty of this book, much like his other works, is that Siegel takes the fear and mystery out of the subject matter, breaking down the complex into small, manageable concepts. The writing is clear, thorough, well-illustrated, and most of all human." "The book is a tutorial as well as a reference manual. Even as a professional mechanic, I find that my Bentley books all have dog ears from frequent visits on a particular subject or testing procedure. 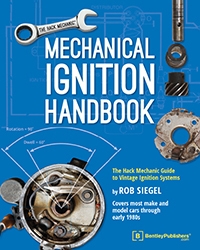 Learn more about the Mechanical Ignition Handbook: The Hack Mechanic Guide to Vintage Ignition Systems by Rob Siegel on our webiste, or read Paul Wegweiser's full review in the December 2017 issue of Roundel, the magazine of the BMW Car Club of America, (and reproduced below).